Entry Fee: Single entry: Free. 5+ Singles: 50 USD, 10 USD for each additional photograph. Series (up to 10 images): 60 USD. CALL FOR ENTRIES! LensCulture Street Photography Awards Now Open. 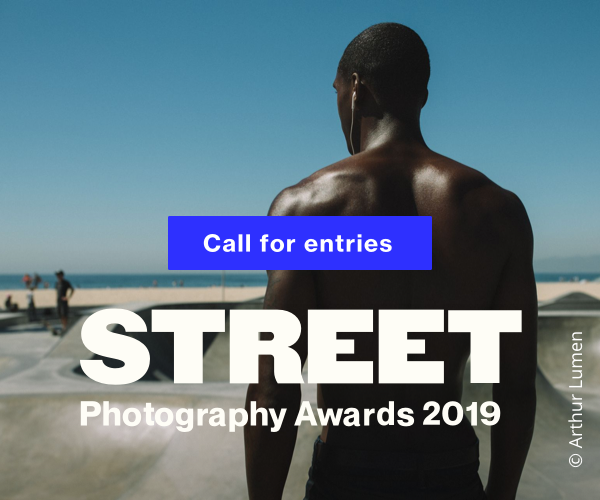 The 2019 LensCulture Street Photography Awards seek the most talented street photographers around the world, those who are sharing a unique perspective of their world through remarkable street photography. Awards include an exhibition in New York City, international photo festival projections, massive exposure to international press + our global online audience of three million, publication in The Best of LensCulture – Volume 4, plus everyone who enters gets free access to the first chapter of The Art Of Street Photography, a fantastic online course from Magnum Photos. What are you waiting for? We can’t wait to see your work! In partnership with Schilt Publishing, we’re thrilled to be planning for our fourth book, featuring the work of LensCulture’s award-winning photographers. This beautifully printed and unique collection of photographic work will be available for purchase and distributed to influential industry members worldwide. Everyone who enters this award will get free access to the first chapter of The Art Of Street Photography, the first online course from Magnum Photos. Simply start a submission and we’ll give you the chance to try this fantastic learning opportunity. The Art of Street Photography brings together seven Magnum photographers plus industry experts who share their unique insights, vast knowledge and world-class experiences to help photographers develop their photographic practice in the street and beyond. We are pleased to offer winners and jurors’ picks free access to the entire online course - 10 really great chapters of insight and inspiration from the world’s top photographers. Award winners receive press coverage from publications and media outlets around the world — the kind of exposure that can lead to viral, global recognition of your work. Winners, finalists and selected entrants have been featured in major publications including BBC, The Guardian, The Washington Post, Internazionale, VICE, The Times of London, Huffington Post, Spiegel Online, The British Journal of Photography, and The Telegraph. Share your work with the world. 3rd Place: $1000 Not eligible to enter? - Find contest where you are. COPYRIGHT: LensCulture recognizes you retain full ownership of the copyright in each photograph that you have submitted / All photographers retain full copyright for their work USAGE RIGHTS: Winners, Jurors’ Picks and Finalists grant LensCulture limited, restricted use of winning photos only to promote the photographers themselves and in connection with marketing the Awards competition itself. All entrants agree that all photograph(s) submitted to the competition may be reproduced (with photographer copyright credit) and used to conduct and promote LensCulture competitions. You hereby grant LensCulture with a right to use submitted photographs in the framework of such promotional activities.